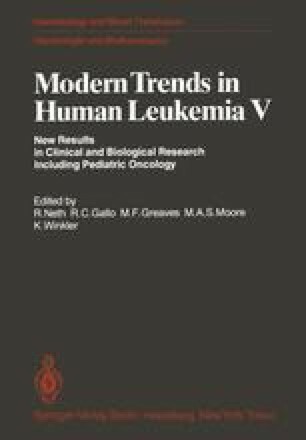 It is now clear that not only the immunological but also the biochemical characteristics of leukaemia cells are similar to those of the normal cells from which they arise. This has been most clearly established for the lymphoid malignancies and particularly in thymic-derived acute lymphoblastic leukaemia (Thy-ALL). Close similarities between Thy-ALL leukaemic blast cells and early cortical thymocytes in surface membrane antigen phenotype, in terminal deoxyribonucleotidyl transferase (TdT) content and in pattern of purine enzymes have recently been established . These findings have helped to establish the exact cell of origin of Thy-ALL and made possible its diagnosis by single cell analysis in bone marrow or extra medullary sites. They have also led to the treatment of this disease with 2′ deoxycoformycin (dCF), a specific inhibitor of the purine degradative enzyme, adenosine deaminase (ADA). Part of the stimulus to this research into the biochemistry of the thymus and the treatment of Thy-ALL with dCF has arisen from observations on children with severe defects of immune development due to congenital deficiency of ADA or of a second purine degradative enzyme, purine nucleoside phosphorylase (PNP). Lack of these enzymes causes absence of T- and B-lymphocytes or of T-lymphocytes respectively but other functions of the body, including haemopoiesis are largely unaffected.